New places are always popping up at Select Citywalk in Saket and we’re telling you all about the five new stores that have opened in the last five months that you need to check out. Now, get those cards out! Honestly, buying tea at Sancha is an experience. They’ve got over 100 types of blends including Peppermint White Tea, Jasmine Blooming Tea, Lavendar White Tea and Vanilla Masala Chai, all of which, you can try before you buy. 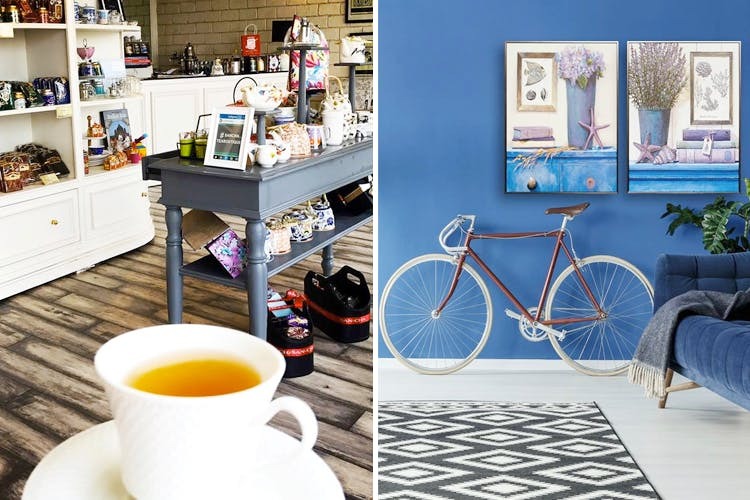 This place is a paradise for all the tea-lovers as it also sells tea-infusers, dainty, English tea kettles, cute, flowery trays and more accessories we just want to stock our shelves with. Need a break between all the shopping? Be sure to drop by Sancha. One of our favourite stores for breezy anarkali kurtis, 1469 Original is a great place to shop from if you love a bit of desi prints and slogans in your wardrobe. Think phulkari dupattas, bagh jackets, Bhagat Singh tees, chunky juttis and more; this two-month old Saket store will have it all. In case Saket seems too far away, they’ve also got a store in Janpath that you can check out. Can’t get enough of yummy handmade soaps, refreshing face mists and luscious lip balms? You’ll be spoilt for choice at Kama Ayurveda. As soon as you enter the store, you’ll be greeted by the scents of mogra, rose and lavender and there’s just a massive variety of products that’ll bring out the hoarder in the best of us. Opened almost two months ago, Pandora is a jewellery brand from Denmark that’s known for its hand-finished jewellery made with sterling silver, and 14 or 18k solid gold. This brand, that has outlets in more than 100 countries does everything from earrings and necklaces to charms and bracelets. Their jewellery is actually super-affordable with minimalist, sterling silver rings starting at INR 1,999. Redecorating your home? Be sure to drop by The Decor Kart. They’ve got owl glass vases, graphic-print cushions, decorative bowls, lamps and more. You can also expect a mix of vintage clocks, pastel-coloured bowls, and pineapple table accents that can turn dull corners into spaces you’ll love.